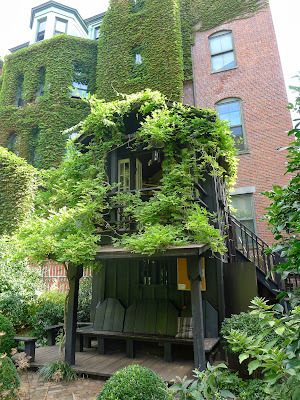 In New York's East Village I've discovered some wonderful places. 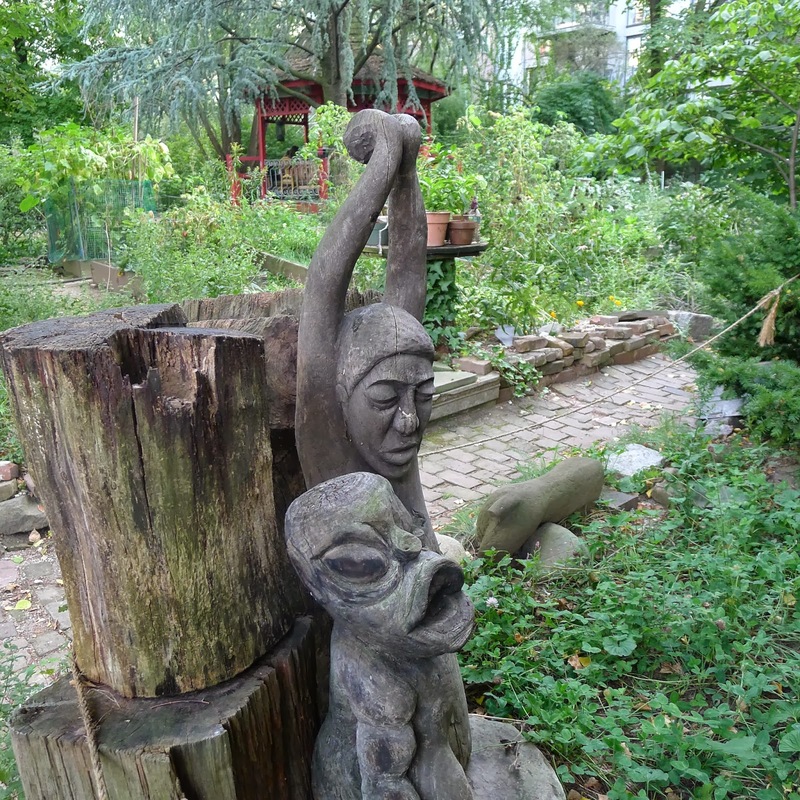 They're community gardens, lush green parks that you come upon so unexpectedly. The scale of these gardens makes it easy to find quiet corners to be in. Unlike Central Park with it's grand vistas these gardens make you feel as though you discovered a secret world. 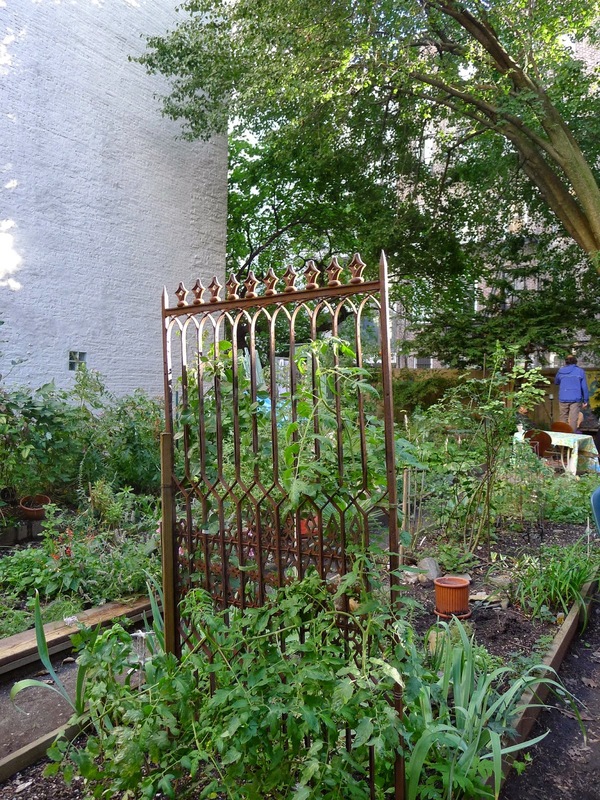 New York City has a history of community gardening going back to the 1930s. 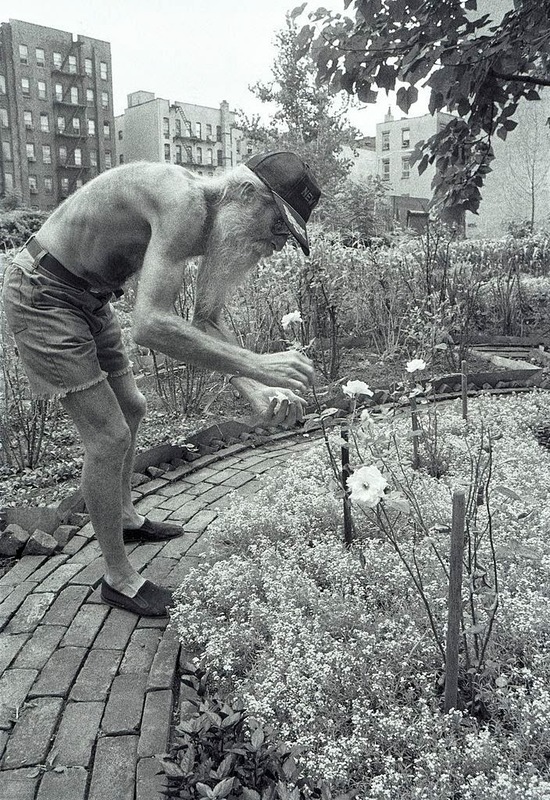 During the Great Depression, five thousand relief gardens were sponsored on vacant lots, for use by unemployed people. The program was cancelled in 1937 when the US Department of Agriculture initiated a food stamp program. For the next few years the public garden program lay dormant, but when World War II broke out the city announced that all available city-owned land could be cultivated as Victory Gardens. 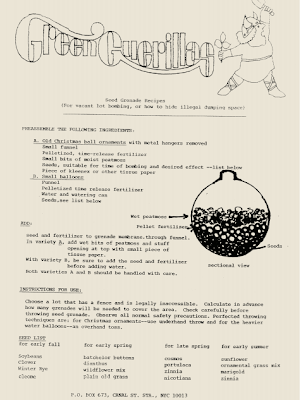 With the war’s end and the advent of frozen food, the Victory Garden program came to an end. 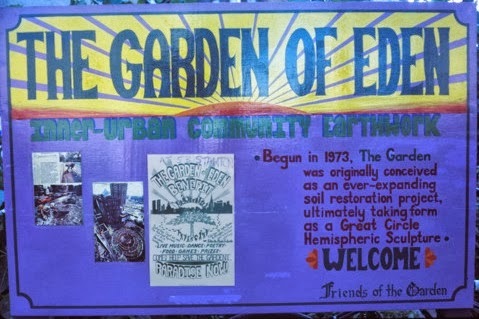 One of the creators of the new community garden movement, which came from the neighborhoods, not the government, was Liz Christy. Christy was an artist who lived near the Bowery, on Mott St., and in 1973 took it upon herself to turn a trash filled lot on the corner of Houston and Bowery into a garden. She worked with a group called Green Guerillas. 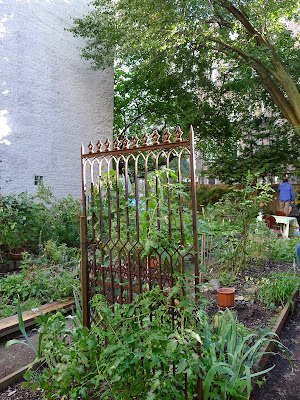 They cut through the chain link fences, threw seed bombs into vacant lots, and taught anyone who wanted to start a garden what they needed to know. 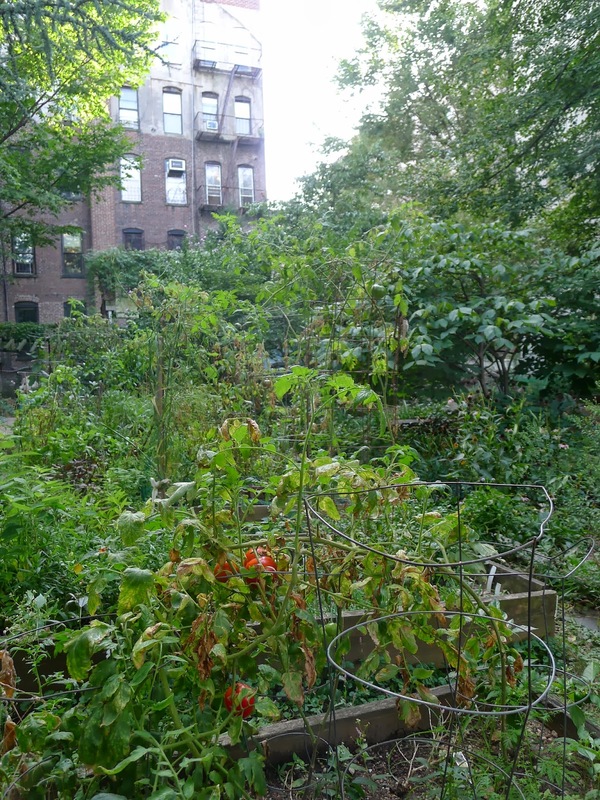 In 1974 the city agreed to lease the plot on Houston and Bowery to the "Bowery Houston Farm and Garden" for $1 a month, and it became the first official community garden in the city. Gardeners built 60 vegetable beds there. 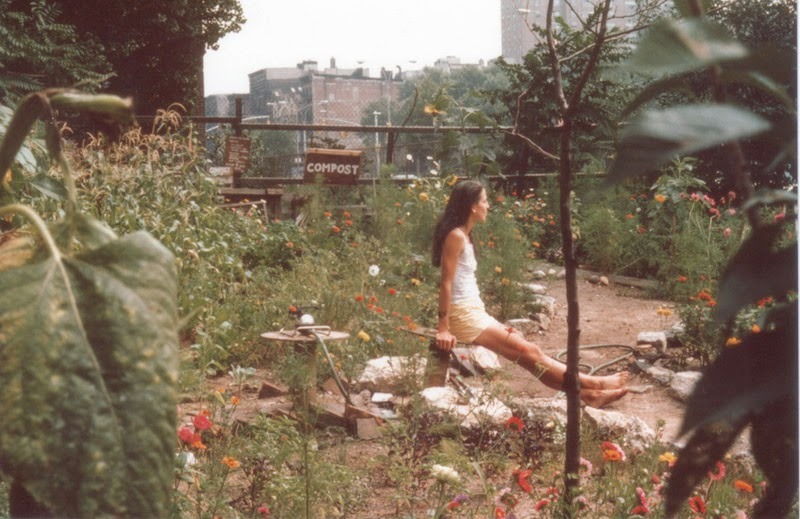 By the time Liz Christy died from cancer at 39 years old, in 1985, hundreds of community gardens had been started in New York. The garden she started continues today, and is named in her honor. Wilder Quarterly has a great article about her here. 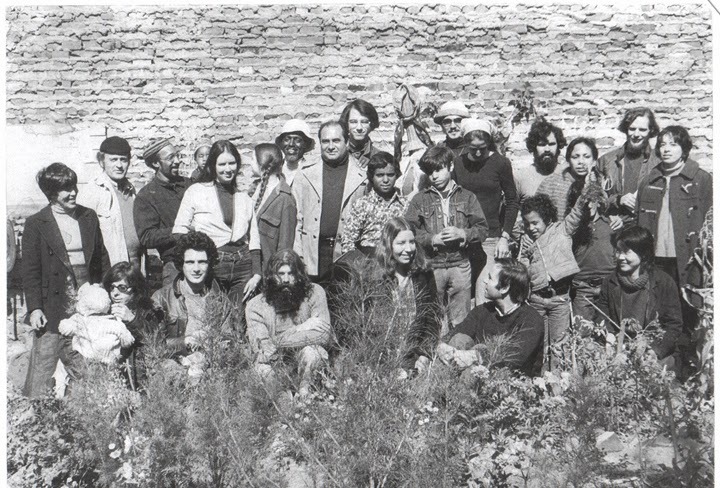 Above: Liz Christy (I think she's the one in the scarf looking down) and the Green Guerillas. Above: Pioneer gardener Adam Purple. 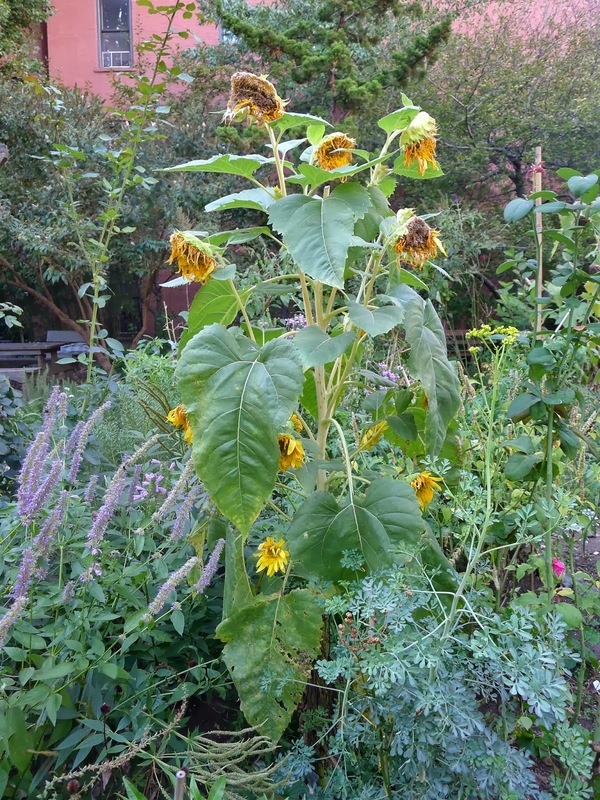 Another early community gardener is Adam Purple. 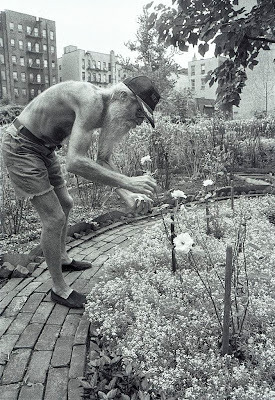 In the spring of 1975 on Eldridge St. between Stanton and Rivington, he was determined to make the abandoned lot behind his apartment into something beautiful. He called it the Garden of Eden. 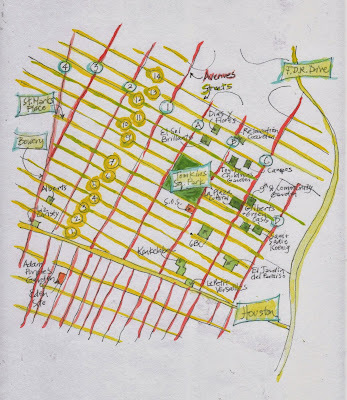 Adam and his companion Eve, both dressed in purple, biked to Central Park to pick up hansom carriage horse supplied fertilizer, and started with a circular pattern of planting. As the buildings on either side of the first were torn down the diameter of the circle grew. By the early 1980s the city was looking for locations to build housing for half a million people. In January 1986, after many battles in court, the city bulldozed the garden allowing developers to build low cost housing. 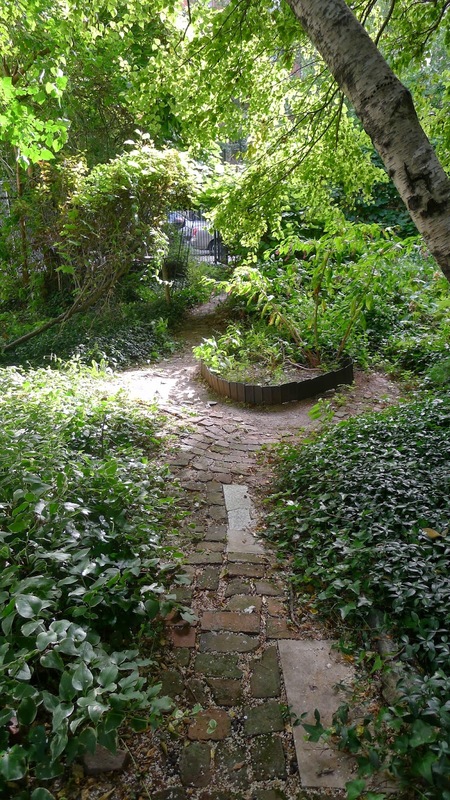 Because this was mostly the work of one person, rather than a community effort, the judge felt it wasn't integral to the community, though it's role as a green space was certainly of great value. 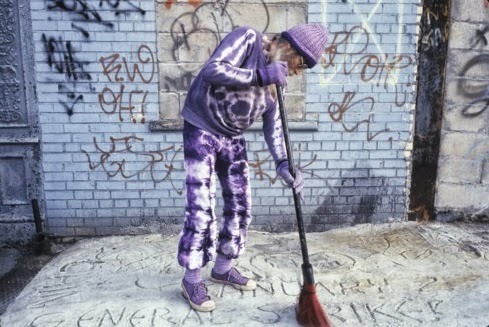 Artist George Bliss painted purple footprints all over NY walking to the location of where the garden had been. Several organizations started, giving help and resources to people wanting to start a garden, and to keep them going. 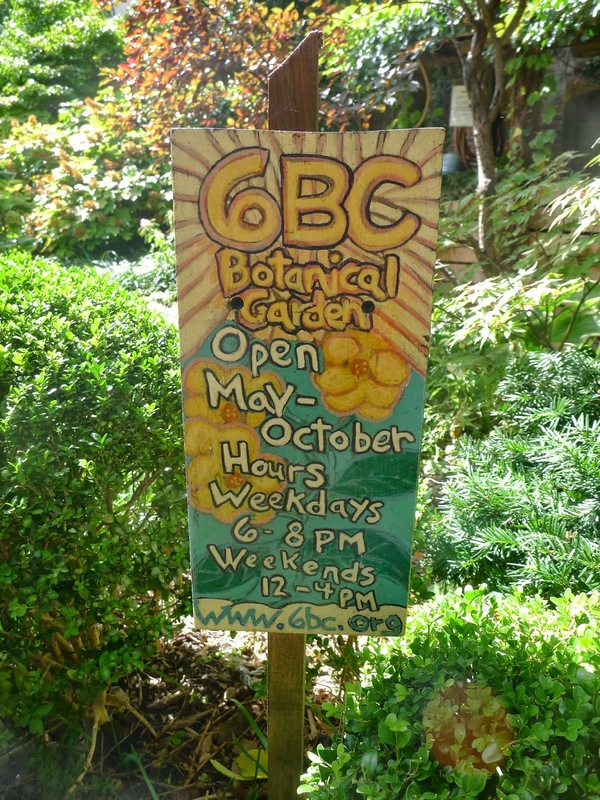 Green Thumb was started to give one year leases to groups who wanted to garden on city owned land. 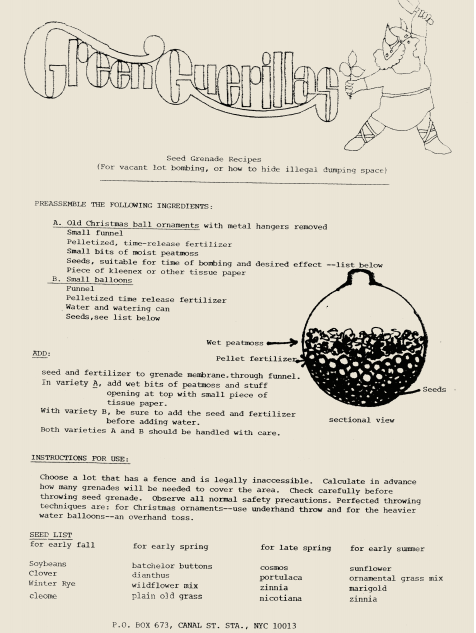 They distributed fencing materials,soil, plants, and tools, organized workshops on gardening techniques, community organizing, and membership information. 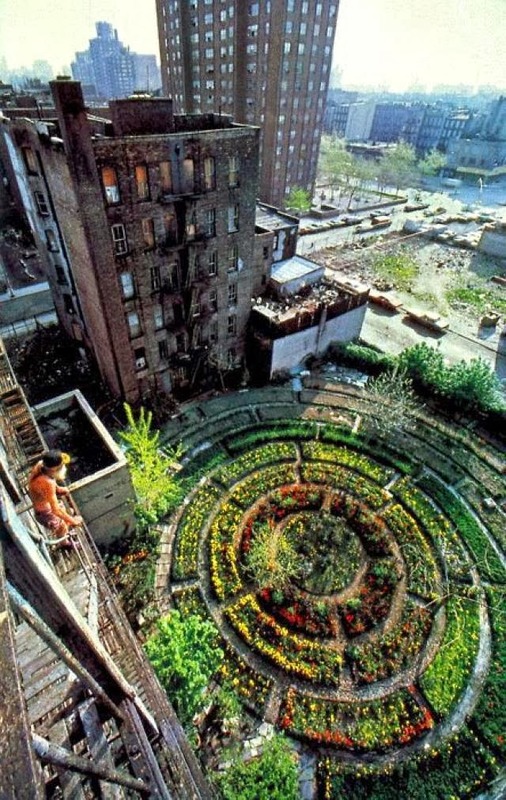 They were seen as temporary gardens, but the longer they lasted the more important they became to the people who worked and used them. 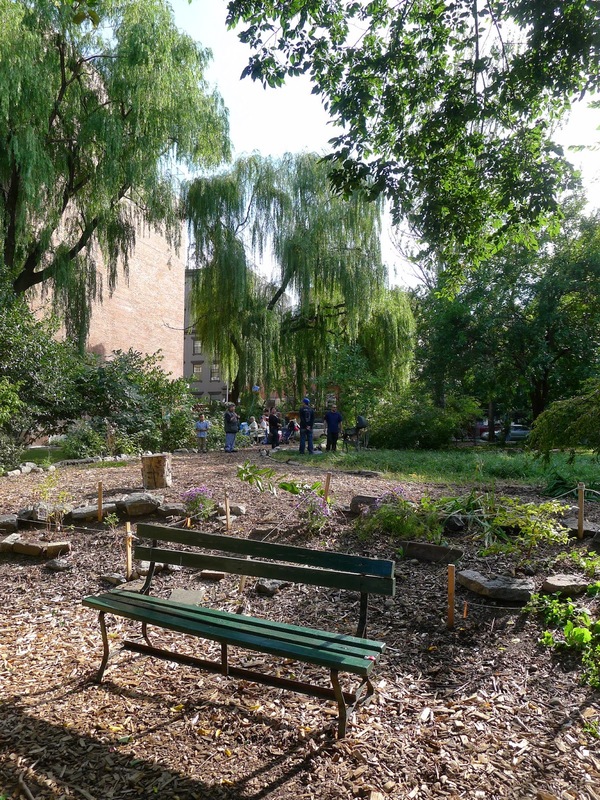 A deal made in 2002 protects about 600 gardens provided they meet required standards. About 150 gardens were sold to developers as part of the arrangement. 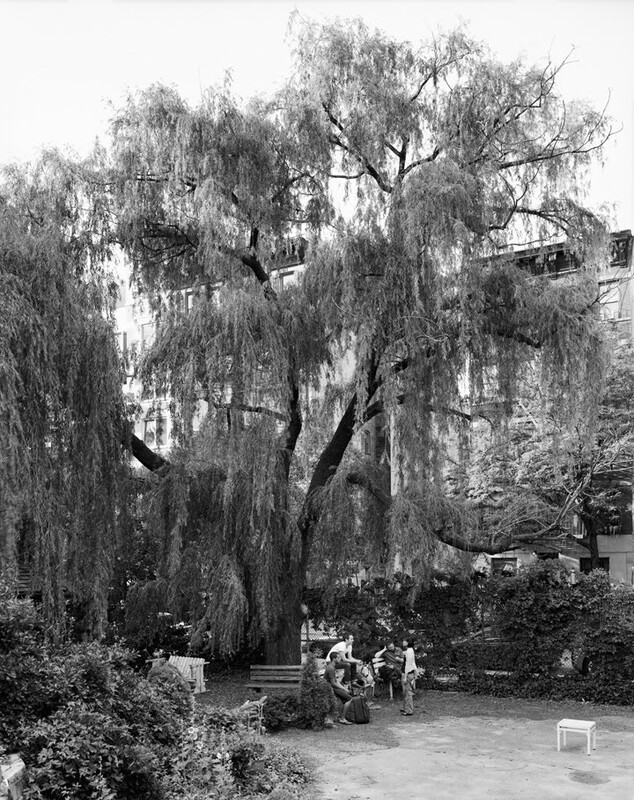 The Trust for Public Land and the New York Restoration Project have helped to preserve many of the gardens. 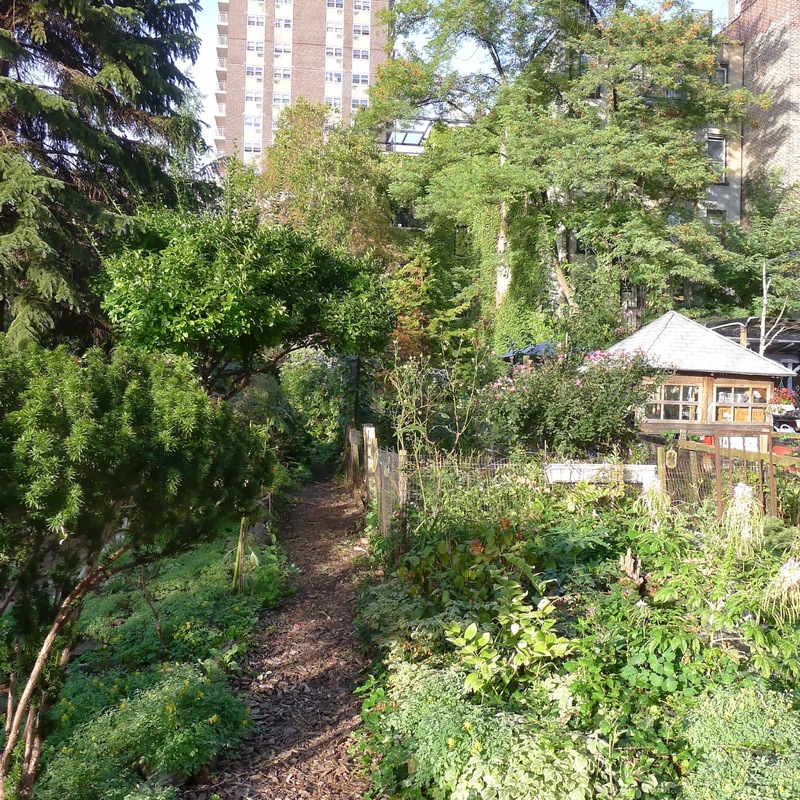 Here's a link to the Green Thumb map showing all 39 gardens on the lower east side. Below: Albert's Garden, on 2nd St. between Bowery and 2nd Ave. 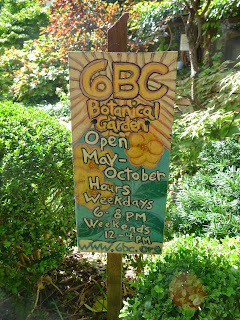 It began in 1971, the earliest of all the gardens I've included. Above: A friendly seating area rests on a broken piece of wall. Above: The fantastic leaves of a Red Mulberry tree. Above: Birds enjoying a drink from the fountain. Above: The most distinctive feature of this garden...a large crow painted on the wall. Above: Two of the members of Albert's Garden (there are twelve altogether) work on a brick wall. 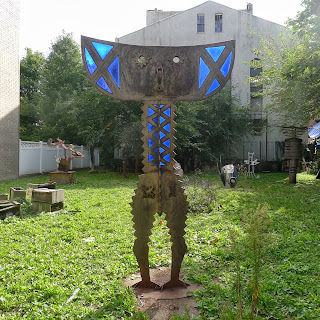 Above: The Kenkelaba Sculpture Garden, started in 1980, extends from 2nd to 3rd Streets, between Avenues B and C. The 3rd St. side is very open, with rough metal sculptures. 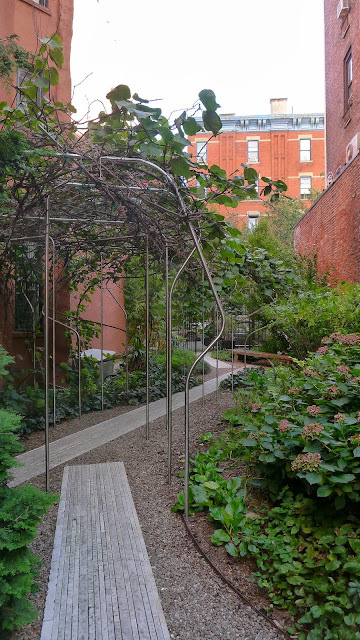 Above: The 2nd St. side is an intimate garden with brick paths. Below: This is Le Petit Versailles Garden, founded in 1996, in a space that had been a chop shop, selling stolen car parts. 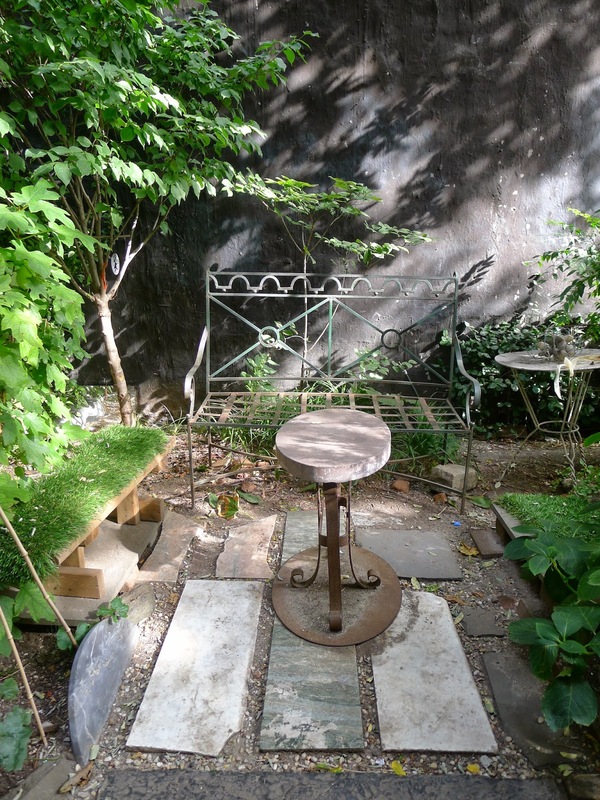 Now it's a lovely garden, run by Allied Productions, a non profit arts group. It's home to theatrical performances and a little theatrical in decor, across 2nd St. from the Kenkelaba Garden. Above: A collection of mirrors rest on the wall reflecting plants from across the way. Above: An exotic vine grows around a mirror. 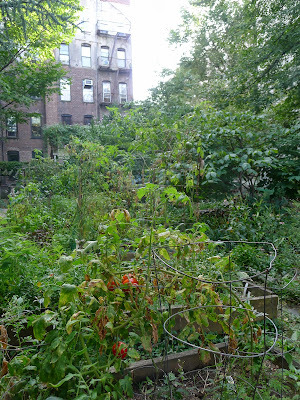 Above: The surprising thing about this garden is the proximity to Houston St...just outside the back gate. Below: This is El Jardin del Paraiso, founded in 1981. It runs from 4th St. to 5th St., between Avenues C and D. When I entered on the 4th St. side I was happy to see the large willow had survived Hurricane Sandy (some willows in the area were severely damaged) and also to see the nest like tree house at the base of the tree. 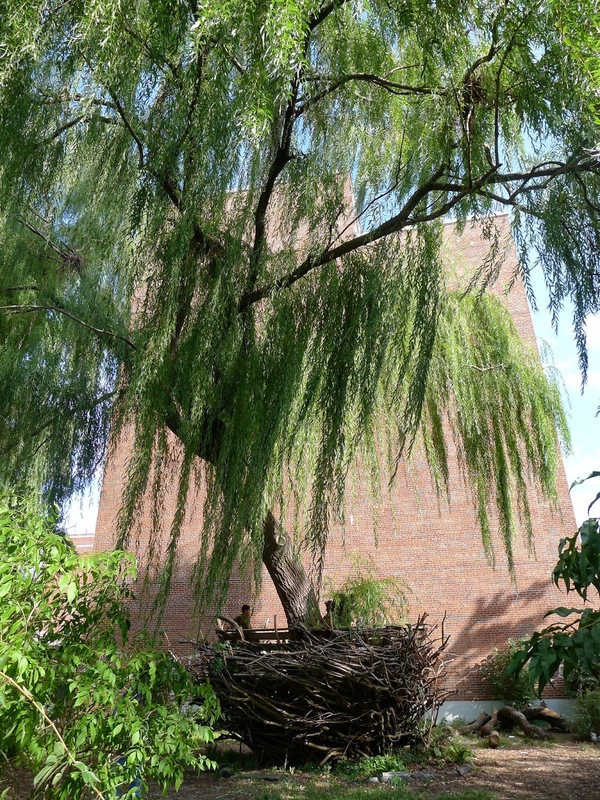 If you look closely you'll see kids playing at the top of the nest structure. 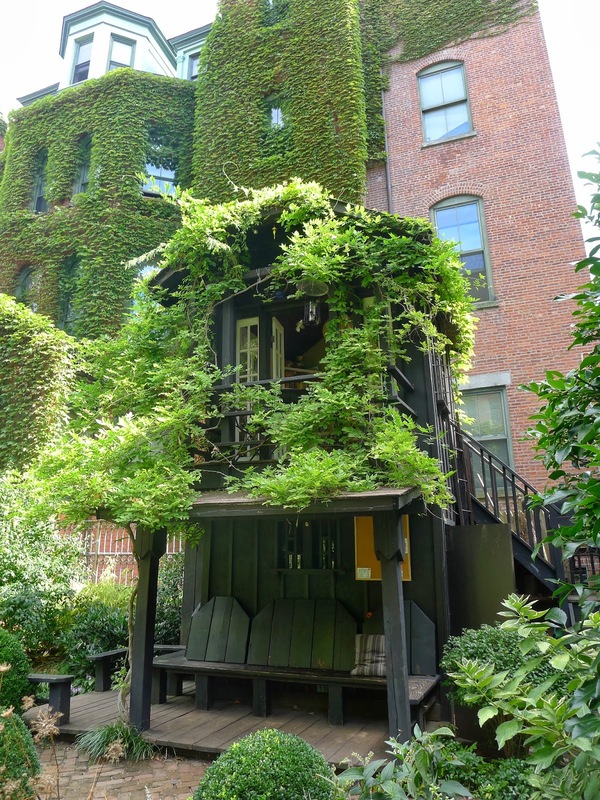 Above: Another view of the tree house, designed by Roderick Romero. Above and below: A low wall and a planting container constructed from broken pieces of tiled floor, stones, brick, and decorative concrete. This garden has a section devoted to vegetable beds. Above: Fish in a small pond. Above: There are chickens running loose in the park! This garden is the kind of place where families picnic, as it's got open space, a picnic table, and the very appealing treehouse. Above: The view from the 5th St. side. Below: 6BC Botanical Garden, started 1981, is the most landscaped of all the gardens. There's a wide array of plants, with lovely trellised areas to be alone as well as a sunken stone grotto area for gathering in a group. There's a tiny cottage with a view from the terrace. Classical music is often playing, creating a tranquil timeless atmosphere. As the name suggests, it's on 6th St. between Avenues B and C.
Above: Some of the brick is laid in circular patterns. Above: The downstairs of the cottage is used for gardening supplies, but the upstairs is for anyone who visits. Below: As you walk north towards 7th St. on Avenue B, you'll pass an unusual spice store that's worth visiting. It's called S.O.S. 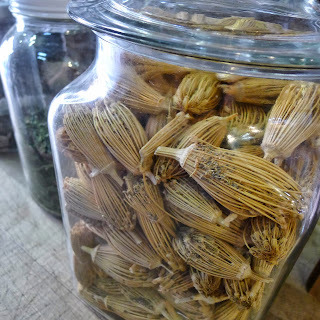 Chefs, and has a fantastic collection of spices, infusions, and oils among other things. Above: Above the doorway there are spices in glass boxes set into the wall. Above: Delicious waters such as peppermint and cinnamon and rose. 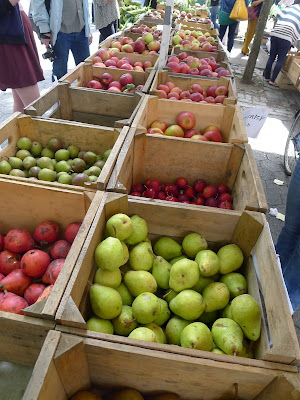 Above and Below: At the Farmers Market along Tomkins Square Park on Avenue A....apples, pears, potatoes, and onions. 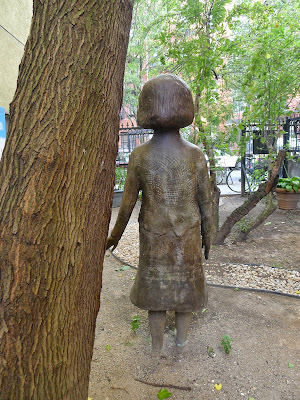 Below: On 7th Street between Avenues C and D is the Sam and Sadie Koenig Garden. The landscaping is sparse, but what makes it special is a Kiki Smith statue. 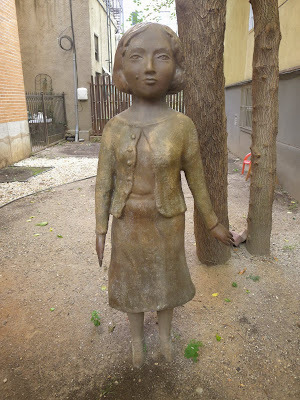 She's a resident of the block and donated the statue to the garden. 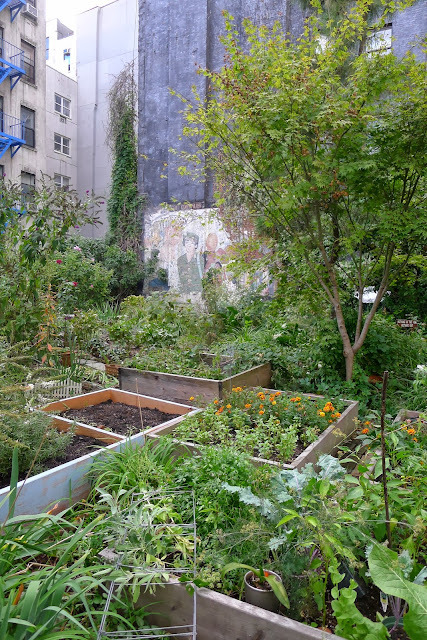 Below: The Green Oasis and Gilbert's Garden, on 8th St. between Avenues C and D, was founded in 1981, rescued from the rubble and debris by two friends, Norman Valle and Reynaldo Arenas. It's a combination park and vegetable plot garden. 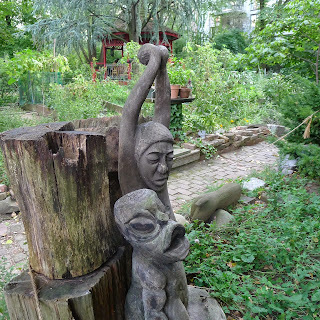 There are bee hives and a koi pond and beautiful wood carvings. Lots of children's events take place here, and kids get involved with the gardening too. The corner of 9th St. and Avenue C is really the epicenter of the area's community gardens. La Plaza Cultural, on the southwest corner, a large garden, is a place to play, run around, and watch performances, along with a number of vegetable plots. 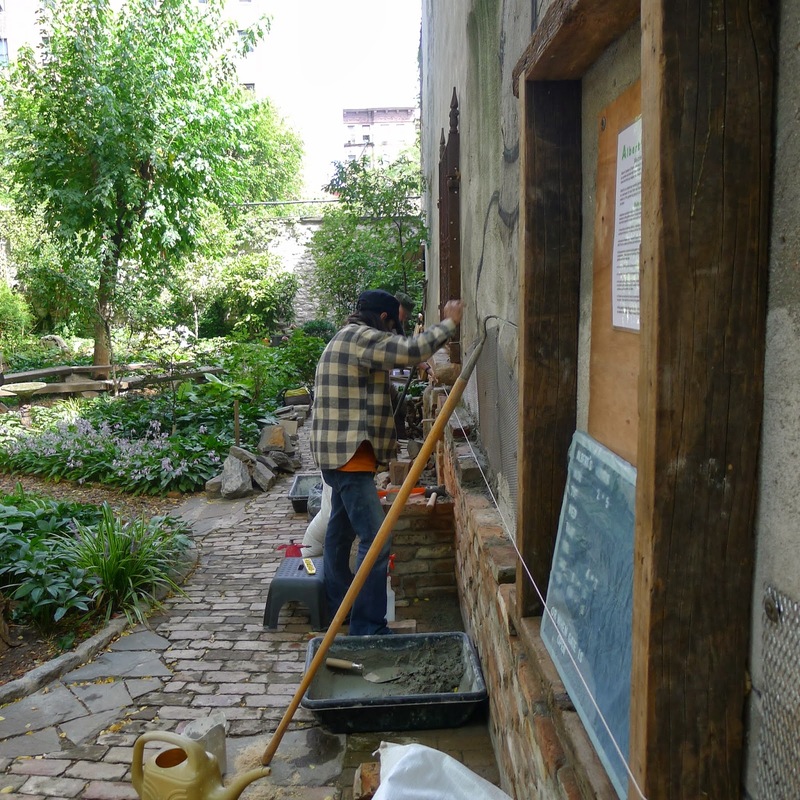 At their link you can see some great photos of people working on the garden. Diagonally across the way, the 9th St Community Garden and Park, another large garden on the northeast corner is full of lovingly attended vegetable plots in raised beds, with places to sit scattered in between. There's a strong community feeling there as a result of all the time spent together gardening, sharing meals, as well as dancing together to live music at the concerts that take place here. Below: La Plaza Cultural Armando Perez, south west corner of 9th and Avenue C, started in 1976 by "The Real Great Society", a group of former gang members, activists, and artists. 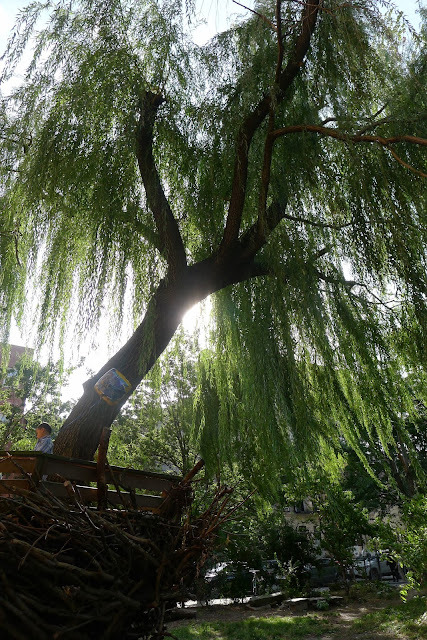 Above: This beautiful Willow that survived Hurricane Sandy anchors the corner of the park at 9th and C. It was planted in 1976. Above and Below: One of the damaged trees has lived on as a place for kids to play. 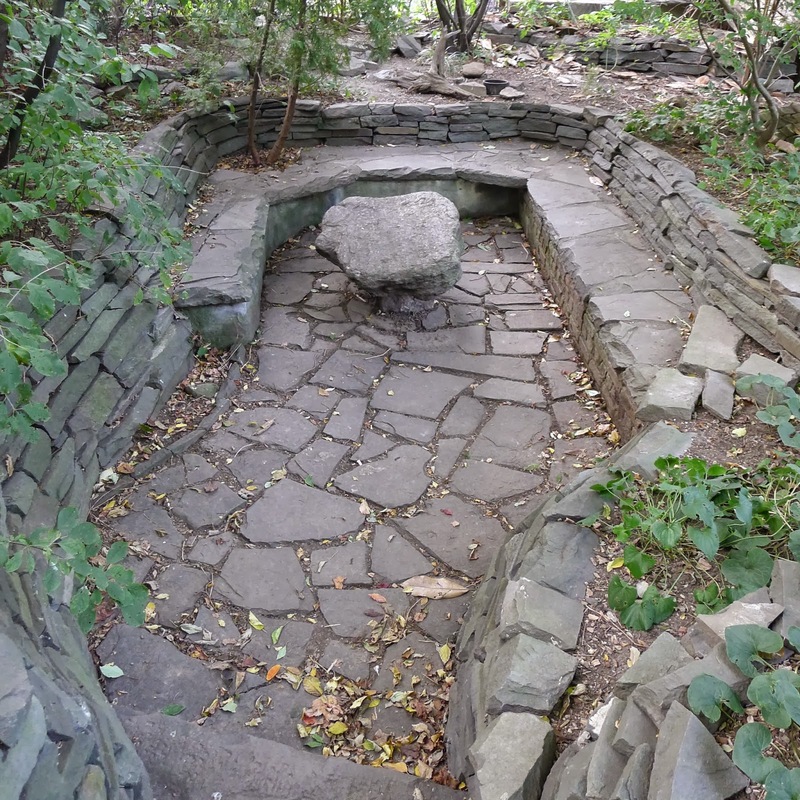 Above: The center of this park is a stone amphitheater. Another great place for kids. In the 70s Artist Gordon Matta Clark helped build the amphitheater using railroad ties and reclaimed materials from abandoned buildings. Above and Below: A painted wall by Patty Kelly is becoming covered in vines. Above: A favorite of mine, Pokeweed, in the garden. Above: Some of the vegetable and flower beds. 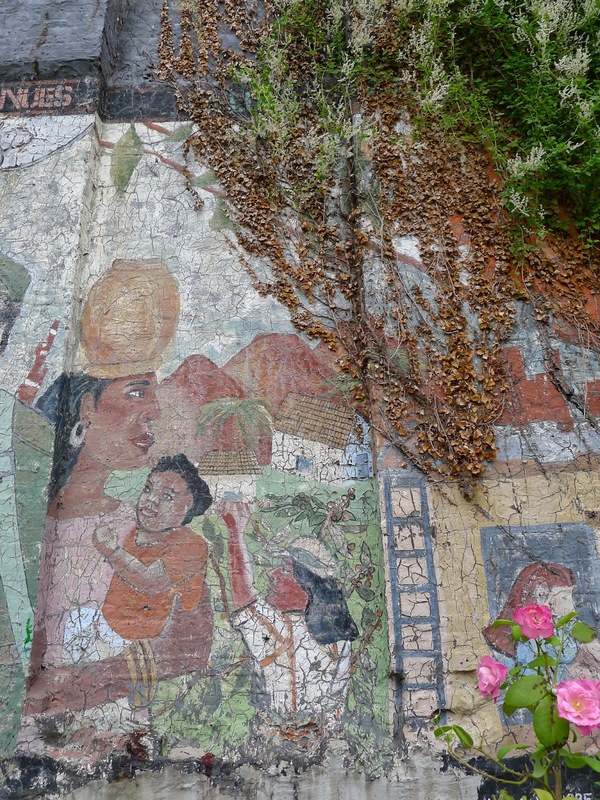 Above and Below: Armando Perez from Latino group CHARAS/ El Bohio, a group that helped found the park, and opened a cultural and community center on 9th St. and Avenue B, got funding for these murals in 1984. 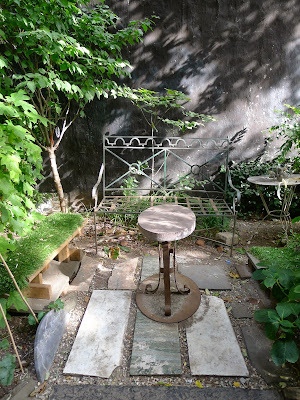 Above: Much has been done in this garden with recycled materials. 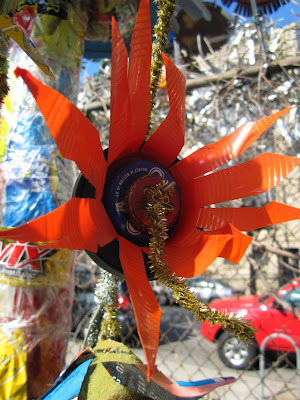 Here bottle tops and caps decorate a tire planter. 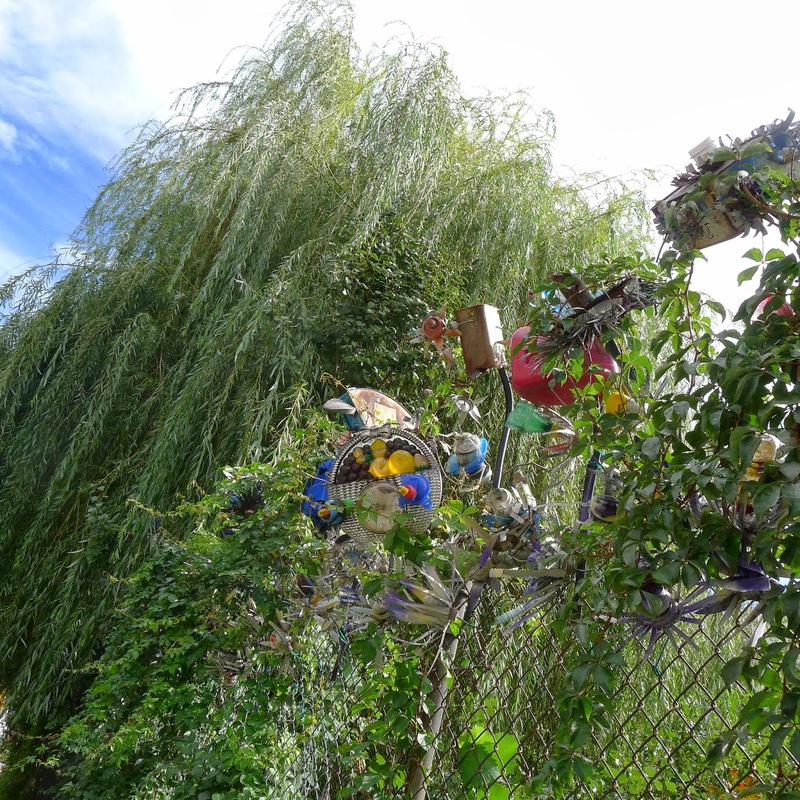 Above and Below: The fence around the garden is festooned with flowers made from plastic bottles and other recycled elements. They were made by Rolando Politi. Above and Below: On the northwest corner at 9th and Avenue C is Esperanto...a good place to stop when you're touring the gardens. 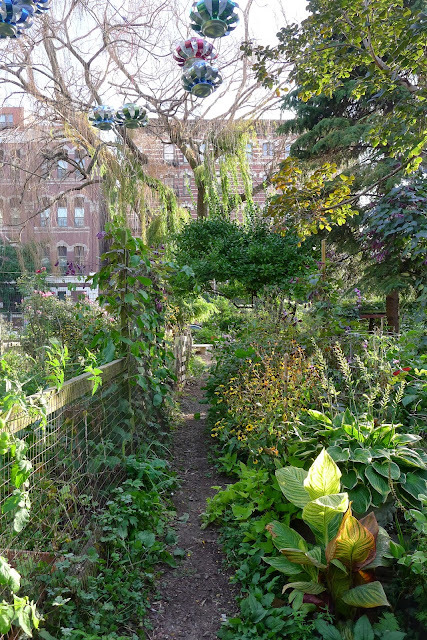 Below: The 9th St Community Garden and Park...a combination of well tended vegetable beds, quiet corners for sitting, a Kitchen, and space for parties too. 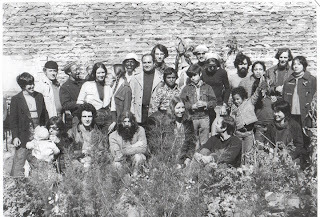 This garden began in 1978. Above: The outdoor Kitchen anchors the center of the garden. Above and Below: Festive lanterns made from recycled plastic bottles hang in the trees. Above: The vivid pods of a River Birch, Betula Nigra. Above and Below: Some inviting places to sit. Like a kid's playhouse furnished with odd mis-matched pieces these arrangements are touchingly personal. 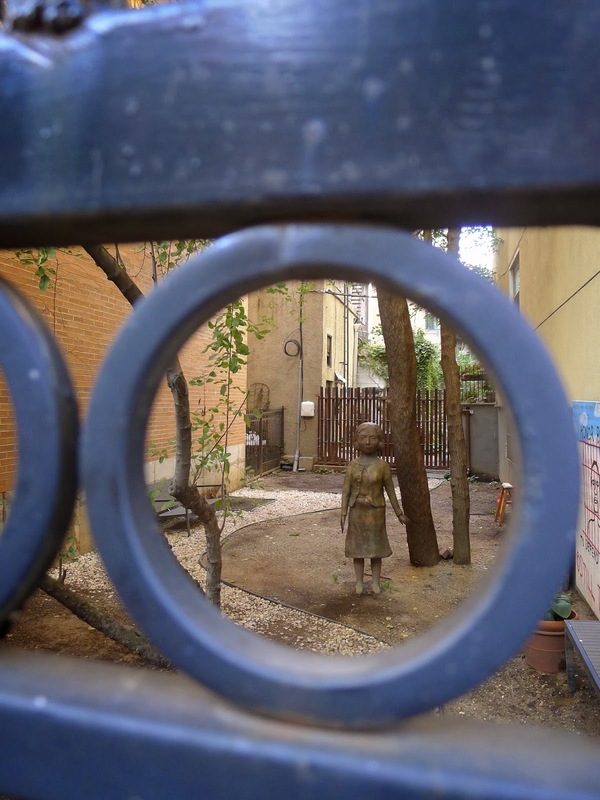 Above and Below: An art installation by J. Kathleen White, each rounded structure, what she calls "Peep Hole Dioramas" holds a miniature scene like the one below. I was told they made it through Hurricane Sandy, which caused floods almost as high as these pieces. 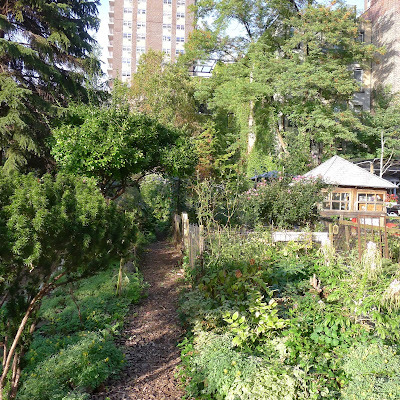 Below: On 11th Street between Avenues B and C is the Toyota Children's Learning Garden. It has a very different character, and a different origin than the other gardens. In 2007 Toyota gave money to the city to transform this site, hiring landscape designer Michael Van Valkenburgh to design the garden. It includes four distinct habitat areas for use in environmental education with local students. It doesn't have the shared community involvement that the other gardens do, but it is still a lovely place to walk on the paths that are shaped to enlarge the sense of space. Below: The Campos Garden, on 12th St. between Avenues B and C, sits next to this painted brick garage. It was started in 1982, abandoned for a time, and rediscovered in 2004. 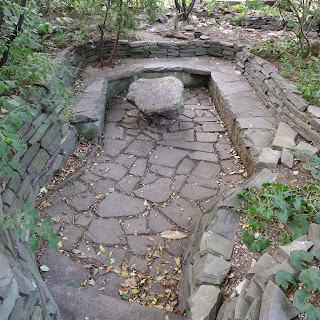 Above: Mostly the Campos Garden, one of the smaller lots, is for vegetable plots, and flowers, though there is a place in the back for picnicking. Below: El Sol Brillante is a large garden, with lots of vegetable and flower plots, seating, and a place to barbecue. It's got a wonderful iron fence handmade by Julie Dermansky in 1993. One of the early gardens, started in 1975, it is one of the few single site land trusts in the city. 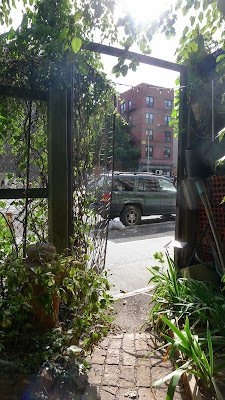 Below: On 13th Street between Avenues A and B is "Dias Y Flores" Garden, started 1978. It has a decorative theme of glass bottle ends buried in the cement, paved by artist Bob Lasher. When I was there a performance was underway in the back of the garden. Below: On the corner of Avenue B and 13th Street is the "Relaxation Garden"....a quirky collection of stuffed animals hanging from the trees, with toys and plastic flowers providing decoration. Started in 1993 as the Yu Suen Dragon garden, it's name and focus changed on the passing away of one gardener and the energies of a new group of gardeners. Every garden here exists because of the steady efforts of its members, who spend much of their free time working the gardens and keeping the gates open. Above: A map of just the gardens on this post. Thanks to Grace Tankersley, who's written a wonderful book that tells about every area garden, "Community Gardens of the East Village". You can find it at St Marks Bookshop, or on it's own site. It was very helpful in researching the gardens. Labels: 6BC, Adam Purple, El Jardin del Paraiso, El Sol Brillante, Esperanto, Grace Tankersley, Green Guerillas, Green Thumb, Kiki Smith, La Plaza Cultural, Liz Christy, S.O.S.